Microsoft's acquisition of Bungie upset Steve Jobs so much that it took the creation of a whole new company to calm him down. You might not know this, but before Bungie became one of the Xbox's most important studios, it had a long history of developing games for the Mac, and when Microsoft swooped in and bought the studio in 2001, Apple CEO Steve Jobs supposedly threw what could best be described as a "hissy fit" at Microsoft CEO Steve Ballmer. Halo, the game that sold millions of Xboxes, was originally intended to be for the Mac and PC, and was actually first announced to the public at the 1999 MacWorld conference. Microsoft's former VP of game publishing Ed Fries said that as soon as word of Microsoft's acquisition of Bungie got out, Steve Jobs called his Microsoft counterpart, enraged that the "premier Mac game developer" was now Xbox only. Microsoft and Apple were obviously rivals, but Microsoft also sold versions of its software for the Mac, making a good working relationship with Apple pretty important. Fries said that he received an email from Steve Ballmer, telling him to get in contact with Jobs and calm him down. Eventually, Microsoft and Apple came to arrangement over porting some PC games to the Mac, and helping Peter Tamte - now of Atomic Games, the studio behind Breach and Six Days in Fallejah - set up a company to do the actual conversion. "I had to go to a Mac developer conference," he said. "And get on stage and talk about this whole new partnership. It was a pretty strange time." 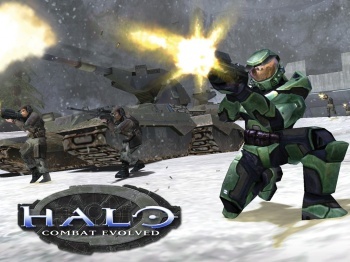 Halo: Combat Evolved was eventually ported to the Mac by Macsoft in 2003.